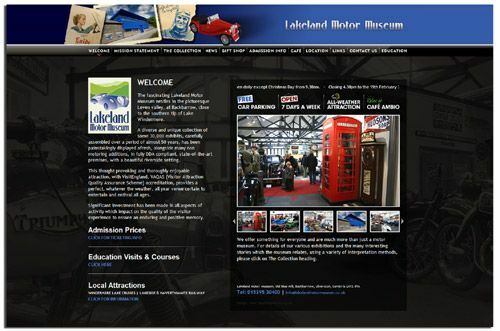 The Lakeland Motor Museum has a new website to go with its new state-of-the-art premises. We had plenty of material to go on the site with a wealth of information about the museum and its new home. The most important element is the photography which captures the museum’s wide ranging appeal, not just to motor fans but to a broader audience. To attract more visitors we’ve highlighted its main selling points: an all weather attraction, open 7 days a week with free parking and a Cafe. This is featured at the top of the home page so visitors can’t miss it.